Looking for a cheap flight from Singapore to Darwin (SIN-DRW)? Flights fares for Singapore to Darwin start at US $ 57.00. Find the best and cheapest flights on this route and other relevant information. Before you book a flight you can use Utiket to find the cheapest flights from Singapore to Darwin for Singapore Airlines, SilkAir, Tiger Airways, JetStar Asia, Virgin Australia, Qantas. All flight data are real-time and accurate. Utiket finds all the cheapest flights from Singapore to Darwin. On average the flight time between Singapore and Darwin is about 4 hr 40 min. Be aware there is a time difference of 1:30 hours: The time in Singapore is 1:30 hour earlier than the time in Darwin. The timezone for Singapore is: UTC +08:00. The local time now: 22:27:00. For Darwin the timezone is: UTC +09:30 and the local time now: 23:57:00. The cheapest price for flight from Singapore Darwin is USD 57.00. Singapore is a major international transportation hub in Asia, positioned on many sea and air trade routes. Singapore Changi Airport hosts a network of 100 airlines connecting Singapore to 380 cities in 90 countries. 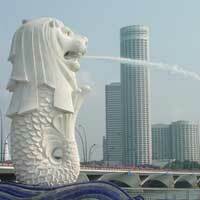 Find cheap flights to Singapore or read more about Changi Airport. The Darwin International Airport serves the city Darwin as well as the Northern Territory. With almost two million passengers a year the Darwin International Airport is the tenth busiest of Australia. 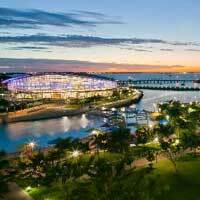 Find cheap flights to Darwin or read more about Darwin International Airport. Which airlines have direct flights between Singapore - Darwin? Need place to stay in Darwin?